So glad you posted this photo. I was wondering about it! Was the nose red at one time? If you have any photos of what the rest of the park looks like today, including the trails on the other side, please post! I didn't take any other photos because I was pressed for time. I will tell you that the other side of the park was being used by children. I always loved this rocket when I was a kid. I wanted to take a pic of the Mott Park sign because it looked so 70's. Remember the par course, with all the excercise stations? I seem to remember drinking wine coolers near this spot one night. I'm ashamed to admit this. As to drinking on golf courses... how many of us have done that? I think the golf course I drank on was Swartz Creek... maybe it was the 9th hole? No clue... somewhere near those Miller Rd. houses. Yeah, we used to sled there as kids too. I think that was the last time I went sledding actually. I remember this rocket from a time when I was too old to use it but absurd enough, at 11, to sit in it in a "cool" pose smoking a cigarette. What idiocy. I remember coming home completely soaked from sledding at Mott Park. Ah, the memories. Yikes...I confused my parks. That was Mott and I was thinking that it was the rocket ship slide at Kearsley. That's where the big turtle was. What memories! I grew up a block away from that park and have fond memories of that rocket and the park in general. My first show me yours I'll show you mine happened in the tunnel between the park and the golf course. Later, in high school, as part of a movie we drove down onto the tennis court. Driving by 15 minutes later in a different car the place was crawling with cops. Phew that was close. Many more memories but those are the ones that stand out. Thanks for the pic. Oh, Mott Park. I lived across from the golf course for years at Sunset Village, and just bought a house on Frank Street, so I've done plenty of stupid things in there. My brother and I went sledding there a couple of years ago, scaring away the crew of kids and parents that were there when we arrived. I imagine the sight of guys in their early-twenties was enough to have the parents want to get their kids out of there. We also shot a short film in the tunnel, around two A.M. in late August. It was fun. When we got the first big snow this season, I really wanted to take my kid down to the hill, but then realized that a three-month-old probably wouldn't fare well out there. We'll just have to wait a few years. Gosh... I can't tell you how many Kool Filtered Kings I smoked uptop that rocket. I only remember skating @ Ballanger Park. 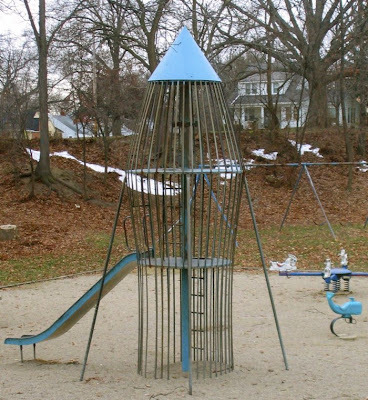 There is another rocket jungle gym somewhere in the Flint area, I just can't recall where exactly. I do remember being in the park sometime in the 1970s after a toddler somehow fell from the second or third level. There was ice skating for a few years in the early 90s near the tunnel entrance, but like Ballenger Park it was just a sheet of ice- no boards. Outdoor skating in Flint? Kennedy Center, Broome/Lincoln Park, Whaley Park, Memorial Park, Water Street Pavilion, and the Swartz Creek Golf Course Pond. Anywhere else? * Mott park 'hitching' rides on the back of cars (winter time). Great posts on memories of Mott Park. Keep current on the neighborhood that you loved as a kid at mottpark.blogspot.com! Great things are happening. this is a recent article about the playground. Mott Park - They used to build a pretty good outdoor ice ring right outside of the golf course club house when it was really freakin cold out. There was one of those round fireplace that hung down from the ceiling that you could thaw yer frost-bitten toes out near. Ouch! People would hose down the side of the hill so that it would be solid ice & you could skate down the hill. Mott park always had so much for kids to do - you wouldn't lay around watching the tube in summer unless really lazy (and of course all kids are 'bored' naturally anyway. Four-Square and tetherball were fun - horseshoes or tennis, badminton, hitting golf balls around, skateboarding, baseball. It was fun in the 60s. OOOOO!!! I haven't seen that thing in ages! My mom used to take me to the park, and I would play in that all the time when I was a little kid.